With a rear set of double size bunk beds your kids can easily bring along a few friends in this Jay Flight 26BH travel trailer by Jayco. 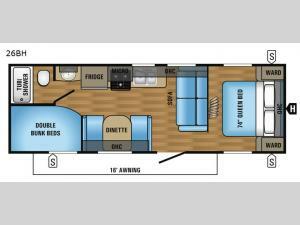 Stepping inside this 26BH model to your right, there is a bedroom with a queen bed and two wardrobes. Above the bed there is an overhead cabinet which helps to keep your things neat and tidy. You can even close the curtain for more privacy. Straight in from the entry door is where you will find a sofa which faces toward the rear of the trailer. The kitchen area with all of the amenities is adjacent to the sofa. There is a double kitchen sink, three burner range, microwave, and a refrigerator. To the left of the entry door there is a dinette where you can enjoy your meals during the day, and at night transform this area into additional sleeping space when needed. 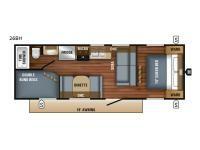 In the rear you will find a set of double size bunk beds with enough sleeping room for four people. The rear corner bathroom has a tub/shower and toilet. Just outside of the bathroom there is a sink with medicine cabinet. You can choose to add a Chill 'N Stor which includes an outside refrigerator, you can also relax under the 16' awning, plus there is much more to enjoy!